“Not everything that is faced can be changed; but nothing can be changed until it is faced,” James Baldwin once wrote. Trying to change a country in the midst of the most aggressive resurgence of white supremacist groups in 100 years is too tall an order for any novelist; just facing it is daunting enough. Henderson’s confessed “personal obsession” with the segregation-era South began with her father’s stories of growing up in a family of white sharecroppers in Georgia in the 1930s. She also gleaned much insight from Arthur Franklin Raper’s The Tragedy of Lynching (1933)—a jarring, almost-real-time study of America’s 20 documented lynchings in 1930—and The Warmth of Other Suns, Isabel Wilkerson’s watershed 2010 book on the Great Migration and the brutal social and economic conditions that drove six million African-Americans out of the South between 1916 and 1970. The incident that stirs a Cotton County, Georgia mob to racial violence in the opening pages of The Twelve-Mile Straight is the phenomenally unlikely birth of twins, one black and one white, to Elma Jesup, the daughter of Juke, a white sharecropper and moonshiner. The white twin presumably belongs to Freddie Wilson, her rogue fiancé, grandson of the man who owns the cotton land the Jesups work. The presumed father of the black twin is Elma’s father’s hired hand, Genus Jackson, who lives in a tarpaper shack on the same farm. Though Jackson insists he’d sooner lay with Juke Jesup’s mule than his daughter, mob rule prevails and the lynching is on. Although Henderson’s intricately wrought re-creation of 1930s Georgia, with its layered racial and economic caste systems, draws heavily on extensive archival research, the captivating medical mystery at the heart of the novel comes from a more unlikely source: the author’s longtime love of TV soap operas. 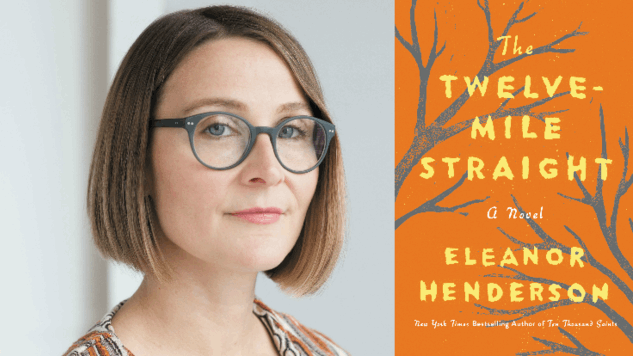 Though the birth of the twins and the lynching of one of their presumed fathers sets The Twelve-Mile Straight in motion, the real driving force of the novel is the relationship between Elma and her de facto sister, Nan. Born four years after Elma to the Jesups’ black house-maid, Nan grows up an orphan in the Jesups’ rented house. Shortly before her own death from oral cancer, Nan’s mother cut out her daughter’s tongue, rendering her mute. Together, Nan, Elma, and Juke form a peculiar sort of family not altogether uncommon in the Jim Crow or slavery-era South: closely bound in some respects and institutionally unequal in others. Elma and Nan grow up together, and then they raise the twins together. In addition to the tight confines of the Jesups’ farm, The Twelve-Mile Straight takes readers to some remarkable places, always brought to life in Henderson’s lean, vivid prose. Elma and Nan’s story expands to encompass an underfunded laboratory at Emory University dedicated to the pioneering study of sickle-cell anemia in African-Americans, and the world-renowned hydrotherapy facility in Warm Springs, Georgia that Franklin Roosevelt first visited for polio treatment in 1924. As stunning archival footage of the president gamboling in Warm Springs’ Roosevelt Pools with polio-afflicted children illustrates, FDR remained deeply engaged with and devoted to Warm Springs for the rest of his life. Steve Nathans-Kelly is a writer and editor based in Ithaca, New York.